I didn’t plan ahead much back when I was studying at university. I ended up studying computer science, even though it wasn’t my first choice. Many others were quite lost with their life plans, but some had put more thought into them than others. I started to get a bit annoyed by these people because they got so much more done than I did, and made it all seem so effortless. By their freshmen year they already had well paid jobs, and still got their studies done faster, while taking breaks to travel around the world or having a whole exchange year in some cool country abroad. One thing these people had in common was that they knew exactly what they wanted to do, and they knew it a long time in advance. Say you’d like to meet your friend on the weekend. Do you think you have a better chance of organizing the meeting if you start planning about it on Friday afternoon, or if you’d already started on Monday? You’d probably say Monday. What about if you want to become an astronaut? Do you think it makes a difference whether you start planning and working towards it today or tomorrow? Well, not so much. But if you started 10 or 20 years ago, you’d notice a difference. There’s no way to guarantee that you’ll find yourself in outer space, but at least you improve the probability if you start working towards it earlier. You can plan for a specific project or a calendar year. The plans can be personal or they can be business related. The purpose of planning is to help you figure out the right direction and the steps to get you there. Mind maps can help you in this process. If you have recurring thoughts about making bigger changes in your life, write them down. Don’t keep them in your head. That way you won’t be thinking in circles anymore, but you can keep moving forward with your thoughts. A clear direction gives you motivation and meaning; actionable next steps help you keep moving and get things done. Everything else is secondary. There’s a whole literature out there discussing how to plan effectively. Here, I’ll introduce you the two concepts that I consider to be the most useful in personal life planning. Start with a generic and long term direction you want to be moving towards, and bring it down to small and specific next steps. A clear direction gives you motivation and meaning; actionable next steps help you keep moving and get things done. Everything else is secondary. When you start planning something new, a typical problem that arises is that all the old and existing gets into your way. You could do this and that, but you won’t, because something in your life, or in your mind, stops you. Starting with a blank slate is a useful technique to forget all that long enough to find out what you really want. So put your past and your current situation aside for a moment. You probably had enough of those in the previous self-biography exercise anyway. What if there were an easy way to open your mind for new possibilities? What if you had a million dollars? What if you could do anything? What would you do if you were sure you would succeed? Asking what-if questions lets you first find what your ideal situation would look like. And yes, that is what is traditionally also called dreaming. You can imagine your next weekend trip, a career change or whatever you think is important for you right now. Don’t confuse what you want with what you think is possible. Start a new map and start answering those questions. Again, don’t think too much, write out things off the top of your head to avoid getting stuck. Keep your thoughts flowing. If you hear yourself making up reasons and excuses for why something is not possible, write those in a separate list, but quickly return your focus to the questions. Don’t confuse what you want with what you think is possible. Also, if you find yourself coming up with concrete action steps, write those into yet another list, but return to the original task. Thinking about the practical details is also getting ahead of yourself. Paint with broad strokes. Define yourself a general direction where you’d like your life to move over time. When you have the big picture it’s time to brainstorm and to generate lots of ideas on how to get moving in the desired direction. First, write down everything that comes to mind. Everything. The quantity of ideas is more important than quality. The most common way that I see people get stuck here is their reaction to dumb ideas. The ideas themselves are not smart or dumb. You just think they are one or the other. Writing them all down allows you to bypass the knee-jerk reaction of dismissing them offhand. Just keep on generating them. Maybe the first ten or twenty aren’t that great, but the good and fantastic ones will come, eventually. After you have a long list of ideas, you can pick the best ones and refine them further. Sometimes you need to clarify facts about your current situation to get a realistic view of the size of gap you need to cross and what is the best first action. Turn the selected ideas to small, concrete action steps. Exactly how small and how specific the steps need to be is personal. For some it’s enough to have a list of keywords to focus on during the week, and they’ll get the things done. Others need more elaboration. “On next Monday at 14:00 I’ll spend 30 minutes online searching for people with similar interests and goals”. If you are not getting things done, keep splitting them into even smaller and more detailed tasks. You’ll soon find the right task size and level of detail for you. And that’s it — for now. We have gone through one round of future planning. Quite simple, right? Now, get to work on those plans. You’ll probably want to come back to these ideas again and refine them further. You can define specific goals, milestones and other metrics to better measure the progress you are making. Rather than a one-time exercise, I see this as a continuous activity in which you gradually get better in defining the direction your life and predicting outcomes for different courses of action. Any thought you have about the future is not the future itself. Your plans are not the actual future. In fact, any thought you have about the future is not the future itself. It’s a prediction at best. And even if the future in your mind has changed, the world outside doesn’t change, until you act on your plans. Persistence is a key to achieving any goals in life, and it seems to me that memory plays a big role in that. 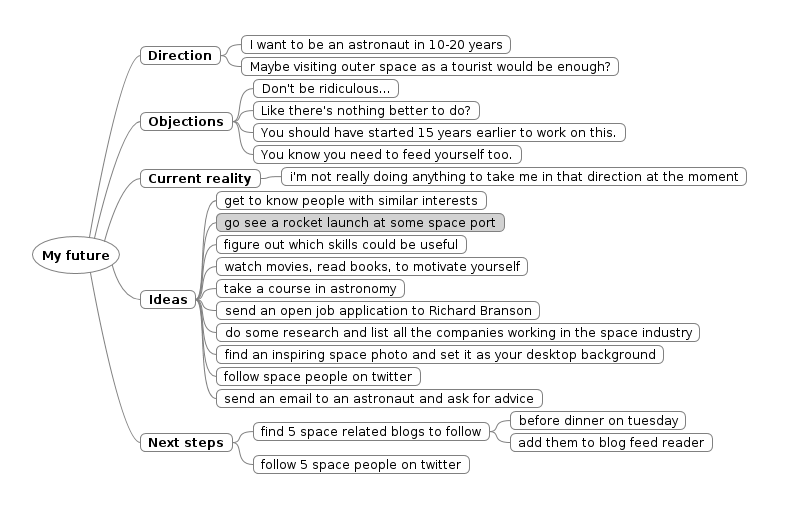 Your mind maps can remind you about your plans and keep you on track. It’s one thing to not give up in face of adversity, but there is something that comes even before that. I’ve seen people give up on their New Years resolutions, but I’ve also seen as many resolutions simply forgotten.